This site was made famous by Jacques Cousteau, who declared it one of the top five scuba diving sites in the world. In 1971 he brought his ship, the Calypso, to the hole to chart its depths. Investigations by this expedition confirmed the hole's origin as typical karst limestone formations, formed before rises in sea level in at least four stages, leaving ledges at depths of 21 m (69 ft), 49 m (161 ft), and 91 m (299 ft). Stalactites were retrieved from submerged caves, confirming their previous formation above sea level. Some of these stalactites were also off-vertical by 5˚ in a consistent orientation, indicating that there had also been some past geological shift and tilting of the underlying plateau, followed by a long period in the current plane. The tilt indicates that this was a movement of the land, rather than a rise in sea level alone. Initial measured depth of Great Blue Hole was 125 m (410 ft) which is the most often cited depth up to this day. An expedition by the Cambrian Foundation in 1997 measured the hole's depth as 124 m (407 ft) at its deepest point. This difference in measurement can be explained by ongoing sedimentation or by imprecision in measurements. The expedition's goal was to collect core samples from the Blue Hole's floor and document the cave system. To accomplish these tasks, all of the divers had to be certified in cave diving and mixed gases. In December 2018, two submarines descended into the Blue Hole, in an attempt to map its interior. Using sonar scanning, the team was nearly able to complete a 3-D map of the 1,000 foot wide hole. 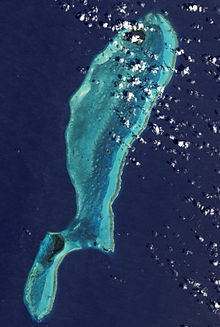 In 2012 Discovery Channel ranked the Great Blue Hole as number one on its list of "The 10 Most Amazing Places on Earth". In 2018, They featured a two-hour special titled Discovery Live: Into the Blue Hole featuring Fabien Cousteau and Richard Branson. Even though the Great Blue Hole is considered a bucket-list dive, one should be aware that it is not for divers of all skill levels – a prerequisite is logging more than 24 dives. It is also not a 'colourful dive', instead, divers witness a dark cave with impressive stalactites. ^ a b c The Great Blue Hole of Lighthouse Reef Atoll, Belize, Central America: Deep Technical Diving to Collect Sea-Level Records. Transactions of the Fifteenth Caribbean Geological Conference. ^ "Belize Blue Hole reef". NASA. ^ "World Heritage Nomination – IUCN Summary Belize Barrier Reef Reserve System (Belize)" (PDF). IUCN/WCMC. ^ a b Jacques-Yves Cousteau (1973). Galapagos – Titicaca – The Blue Holes (Hole). London: Cassell. ^ a b Tysall, Terrance N (1999). 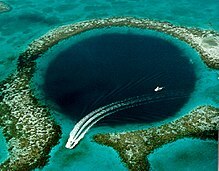 "The Belize Blue Hole Exploration Project". In Hamilton, RW; Pence, DF; Kesling, DE. Assessment and Feasibility of Technical Diving Operations for Scientific Exploration. American Academy of Underwater Sciences. Retrieved 2011-01-08. ^ Street, Francesca. "Dispatches from the bottom of Belize's Blue Hole". www.nbc-2.com. Retrieved 2019-02-18. ^ Robert Lamb; Amanda Arnold (2012). "The 10 Most Amazing Places on Earth". Discovery Channel. Archived from the original on 2012-11-09. Retrieved 2013-09-12. ^ "DISCOVERY LIVE: INTO THE BLUE HOLE". Retrieved December 3, 2018. ^ Ilya Rosado. "What's it really like to dive the Belize Blue Hole". Belizeadventure.ca.